The Wonder Boy set International Records by Identifying Branded Cars..
On July 14th 2013, a boy was born whose love for cars would travel from ear to ear, so much so, he would end up getting recognized for just that – cars! 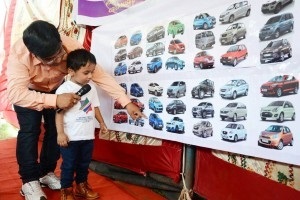 Sai Anish Pattanaik – the wonder boy from Odisha is so wonderful that he set both national and international records with his ability to identify cars even before anyone could say the word ‘car.’ When he was just 2 years old, he already knew the names of 40 cars, along with their interiors and model shape. Just a quick glance was all that was required for the boy to recognize the beast! When he was 3 years old, he could tell apart 60 cars in a manner of a minute – not just by its physical appearance while it remains stationary but also when the cars were swifting past on the roads. 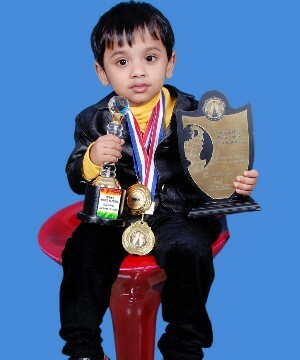 Born at Sunabeda, Koraput, Odisha, Anish is the son of Swaroopa and Saroj Kumar Pattanaik. For his father, Saroj Kumar, this seemed absolutely extraordinary. The boy had the memory of a computer – which worked mechanically and without any interruption. He could tell which model by glancing at just the interior of the car. The little genius was a lover of cars since he could remember, following in his father’s footsteps. When he was 4, he could already pinpoint almost all cars of Indian origin, which is around 80 odd cars and that too in just 3 minutes, 6 seconds. By this time, the boy had already set 3 National and 9 International records. Anything you can think of, the boy had already achieved, be it India’s World Records, Incredible Book of Records, World Records India, Everest World Records, Champion Book of World Records, Assist World Records, and what not! Sai Anish has proven himself extraordinary with his spectacular memory skills. It all started out when his father wanted to buy a car. Anish helped him look up the many different cars on YouTube, learned the names of those cars effortlessly, and when he saw one on the road, it was just all too easy to recall. When kids are just learning to speak and move around, our man Sai Anish has already been recognized by the masses as a car aficionado. The playschool he attends has requested his family not to pay the fees on account of the striking display of his mental prowess. Sai Anish has a long way ahead of him, one that is going to be full of wonderful feats. His unlikely talent is what set him apart and he has done good and brought pride to himself and to his family.